Kids are so cute and sweet they are very important part of our life. Kids always want our attention and love more . As we send messages /wishes to our friends, relative’s we should as well wish them on any event or day with best ways. Now Easter is coming Easter is all about joy happiness and celebrations. 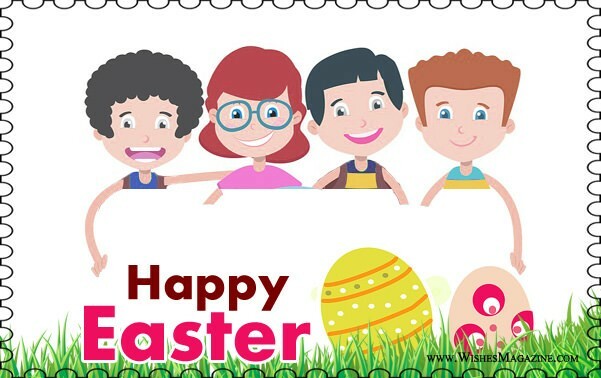 It is a time for fun and joy for all specially for kids, Here in this section we are sharing a collection of Happy Easter wishes for kids, Easter messages for kids you can send them chocolates along. Make the Easter meaningful with pray the Lord and celebrate with joy. Have a joyful Easter, my child. God loves a prayful child; he can hop into your life and bless you with more happiness and lots of surprise you love. Jesus Christ will be happy to inspire a child to be humble and find happiness in life. Celebrate the Easter with a smile and a deep appreciation of this new life for us. May Jesus Christ make your Easter happier and loving as the colorful Easter eggs. Every Easter egg hunter knows where the good stuff is, I wish this Easter bless you with Good health, fortune and happy life. May Eater bless you with cute dreams, happiness, love and joy. May Easter make your celebration of holy love and resurrection of the day. May Easter brings new hopes and spread the word of Lord with this beautiful day. May the season fill your heart with good cheer m enjoy all the chocolate you can swallows and goodies that comes with the season.